A group of Filipino fishermen discovered three lengthy floating containment booms or buoys located in 3 different Barangays about 6 miles from the disputed Bajo de Masinloc ( Scarborough Shoal) the shoal is about 125 nautical miles (230km) West of the Philippines. The fishermen said they did not know why the buoys were there because there was no sign of any oil spills. The buoys have markings appear to indicate ownership by China. The markings showed the company that manufactured it and even has phone numbers. 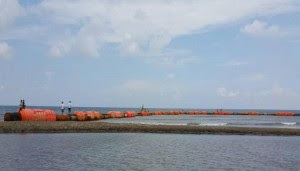 Nine fishermen found the orange – colored floating booms in the sea off Zambales and they towed the booms toward the shore and brought them to 3 barangays – Sitio Lanao, San Agustin and Sto. Rosario.